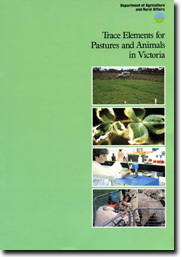 The Publication: Trace Elements for Pastures and Animals in Victoria was prepared by W.J Hosking, I.W Caple, C.G Halpin, A.J Brown, D.I Paynter, D.N Conley and P.L North-Coombes of the former Department of Agriculture and Rural Affairs in 1986. This publication provides a review of the then state of knowledge about the role of trace elements in Victorian grazing enterprises. The review also includes an extensive bibliography of both published and unpublished reports on trace element research work conducted by the former Department, as well as other published papers relevant to Victoria at that time.